Lock in a great price for Angel Cottage – rated 9.6 by recent guests! Host was fantastic, gave us our own space but made us feel very welcome. Rooms are beautiful and clean. Breakfast was exactly what was needed. Would recommend to anyone staying in Drymen. The room was beautiful, clean and comfortable. The hosts were very nice and welcoming. Definitely recommended! Beautiful and very clean room at a quiet location just few mins walk from the central square of the village. The host is very nice and polite. There is nothing to dislike about this place, totally recommended. Arwen the owner was superb. Wonderful host. Beautiful boutique B&B. Gorgeous room that was quirky and Scottish while v modern. 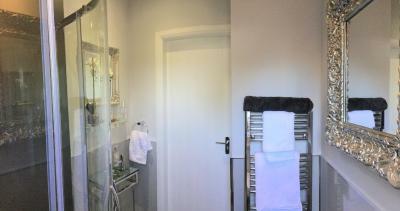 Lovely wee bathroom with a great shower. Breakfast was brilliant. There was a sad and traumatic event on our second night. Arwen managed the situation with skill, care and compassion. Our room was spotless and beautifully presented with some really nice details that made our stay comfortable and enjoyable. The shower was amazing, ideal to really blast away stress too. Our host was lovely, making sure we had plenty of options for breakfast and offered us info on local attractions. Arwen gave us her personal number too, in case we needed anything during our stay. It's a small cottage but there's plenty of room in the extension for, I think, 3 guest rooms so you won't be overcrowded at breakfast and you have a separate key from the main house which allows for everyone's privacy. A warm welcome, and an immaculate property. A lovely shower, and a delicious breakfast. Wholeheartedly recommend staying in Arwen’s lovely home. The property and owners were lovely. The food was really nice. They were very helpful in advising where to eat for evening meal, even going as far as booking a table for us. Great location, clean and very good facilities. Very helpful and friendly owner. Amazing, comfortable, clean and modern! Excellent hospitality from the lovely hostess will definitely be recommending to others and will be back. Just what we needed after a long days walking and ahead of another one. 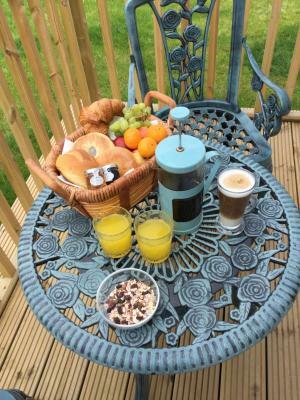 Located in Drymen, Angel Cottage offers accommodations with free WiFi and flat-screen TV, as well as a garden. Glasgow is 18 miles from the bed and breakfast. The nearest airport is Glasgow Airport, 24 miles from the property. When would you like to stay at Angel Cottage? 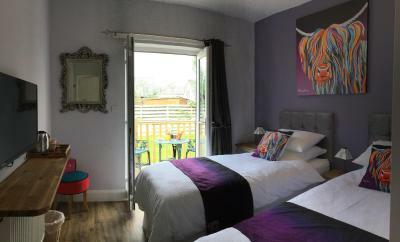 This double room has a tea/coffee maker, private entrance and dining area. This twin room features a dining area, soundproofing and electric kettle. House Rules Angel Cottage takes special requests – add in the next step! Debit card Angel Cottage accepts these cards and reserves the right to temporarily hold an amount prior to arrival. Angel Cottage accepts these cards and reserves the right to temporarily hold an amount prior to arrival. Kindly note after 23:00 the premises are locked for security. If you have any questions regarding this, please use the Special Requests box when booking, or contact the property directly using the contact details provided in your confirmation. A small bathroom sink made washing clothes tricky - had to do it in the shower. An outside line would have been good. However, Arwen put on the heating so we could dry our laundry. Apologies, this is only a minor criticism. The little shelf over the sink in our ensuite gets in the way, it makes it difficult to use the sink bowl. I literally love this place! We stayed here during our first night along the West Highland Way and we couldn't have been better. Our room was beatiful, big and very well decorated. The bed was very comfortable and large! And we had fantastic views to the lovely yard of the house, with all those birds flying and singing around. The bathroom was private and with a perfect shower (a very important feature when you arrived from walking more than 20km). The hostest was so nice and lovely! She prepares the best breakfast ever: there is fruit, yoghurt, juice, toasts, croissants, cereals... and then she askes about what cooked breakfast would you like (there is eggs, sausages, bacon... typical Scottish breakfast). I asked for scrambled eggs and my partner added sausages to his and it was the best cooked breakfast we had during our trip. Besides to all that, Drymen is a very charming town with great atmosphere and a very good pub, don't miss it! I recommend everyone to go to Angel Cottage, I really hope I could stay here any other time again.